Although I have lived near the beach almost all of my life, I have never achieved a golden brown tan. Even when I worked at a pool one summer, I got teased for being the palest lifeguard ever. That's okay, I'll keep smothering my skin in sunscreen and live vicariously through Rosity of PillowsGaloreNMore. 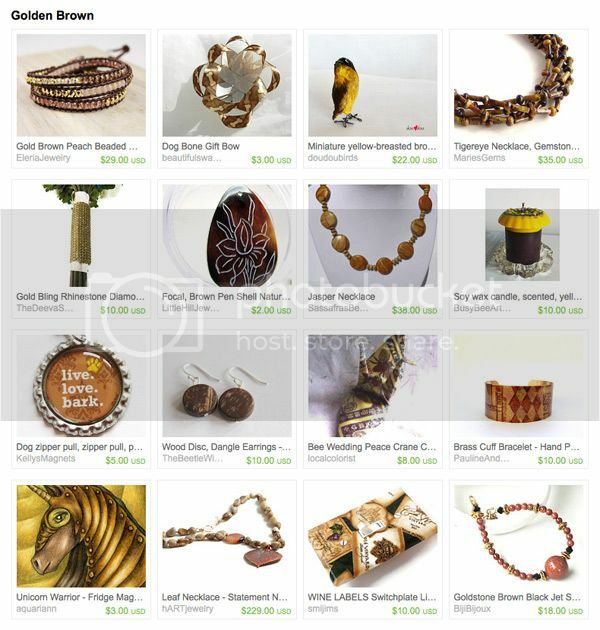 Her handmade gift ideas from the Saturday Night Specials team include wood earrings by The Beetle Wing, brass cuff bracelet by Pauline And Oliver and my golden unicorn magnet. Thank you so much!! I love what your blog!! Oops, did it wrong but corrected it!! I featured your lovely art in my treasury. Love the imagery you create! If only I had a credit card with no limit! I love these golden brown pieces! Found some new favorites for sure! Wonderful stuff here! Love those necklaces, truly a gem! Beautiful treasury. I want a tan too. I love this!!! Chic treasury! I added my FAETeam treasury to this great list!